Fitted Printed Shift Dress With Cut-In Armholes And White Lace Trim At Waist. 36″ From Top Of Shoulder To Hem. Length: Above The Knee. Vintage Dobby – Print (100% Cotton). Dry Clean. Imported. We love everything about the Ashlyn printed shift. 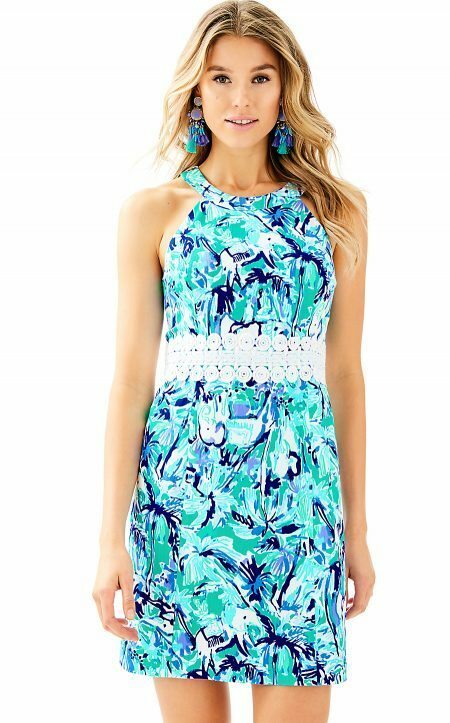 The fitted dress with white lace trim at the waist is the ultimate spring dress. A girl need options: Enjoy an extra 1-3/4″ inches of hem flexibility with this style. Wear as-is or let it out for some extra length.